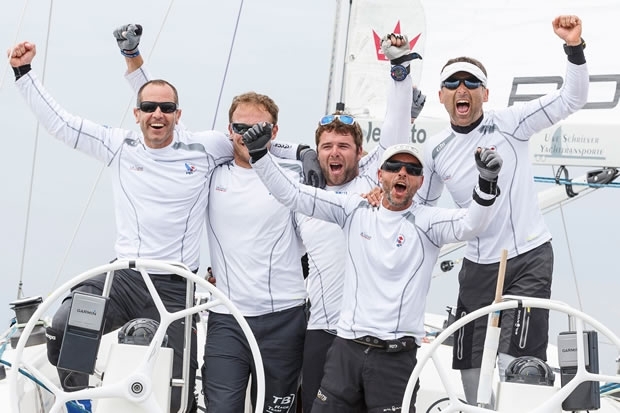 Tomislav Basic from Croatia mastered the light wind conditions of Lake Constance today to secure his first victory of Match Race Germany, the second world championship stage of the 2015/15 World Match Racing Tour. Basic defended the favoured left side of the race course in every race of the final to defeat Switzerland’s Eric Monnin 3-0. “We worked out the left side was the place to be on the first day of the event, and with the wind in the direction it was today, it was the only choice for us, and it paid off.” added Basic. After a disappointing Semi Final performance yesterday against Eric Monnin, Joachim Aschenbrenner had a point to prove today defeating young Australian Matt Jerwood in the Petit Final 2-0. Aschenbrenner finished third in the final event results, and Jerwood fourth. The last day of Match Race Germany drew one of the biggest crowds the event has seen in many years, with the wind direction allowing the racing to be positioned just metres from the shoreline.